Pavilion Kuala Lumpur is an award-winning, world-class mixed-use urban development located in the heart of Bukit Bintang, the shopping paradise of Malaysia. 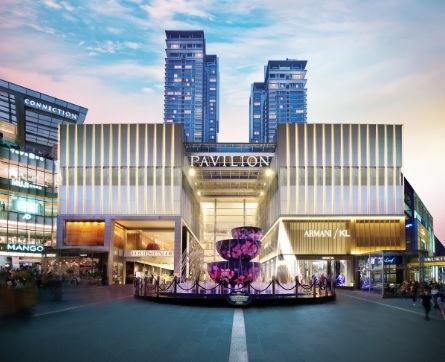 Opened to visitors on 20 September 2007, Pavilion Kuala Lumpur blends the best of the international and local retail world and is positioned as the ‘Defining authority in fashion, food and urban leisure’. The essence of this fountain is a reflection of Malaysia’s multi-racial and culturally diverse society. The fountain features the Bloom of Hibiscus, the national flower of Malaysia, a symbol of opulence, passion and progression. The three bowls represent Malaysia’s races and cultures living harmoniously in unity and ascending to signify the growing aspirations of the people. Description: Pavilion Kuala Lumpur is a world-class mixed-use urban development, comprising a 7-storey premier shopping mall, 2 blocks of Pavilion Residences, Pavilion Tower office block and the upcoming 5-star Royale Pavilion Hotel. 20% of the retail mix are new brands to Malaysia and have chosen Pavilion KL as their first store/outlet in Malaysia. Those highlighted in bold are available in Malaysia exclusively at Pavilion KL.